Good size portion of fish, nice guys and reasonably quick service. Good helping of fries for the price as well. 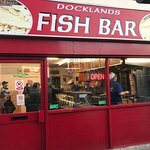 Been to Docklands Fish Bar? Share your experiences!